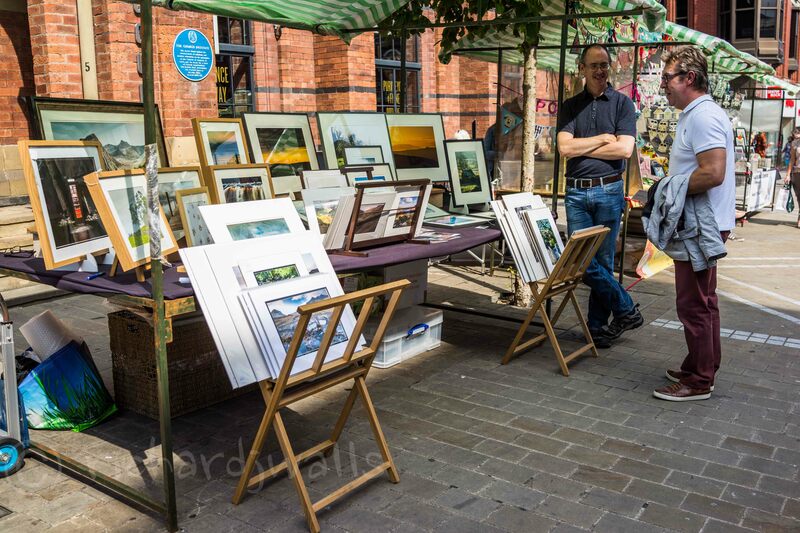 I had a great day at the Artsmix market in Leeds a couple of days ago. I’ve made a new set of framed pictures using my more recent mountain shots of the Lake District and Snowdonia and they looked absolutely great. I’d also got some nicer display gear and on the whole the stall looked fantastic (IMHO 🙂 The new stuff got a really good reaction and I sold a couple of them. The bonus was that nothing got broken or damaged by weather! Not surprisingly I forgot to take my camera (again!) and took this shot with my wife’s smartphone. I’ll be showing and selling at Artsmix in Leeds again this saturday, the first time this year for this Leeds venue. It’s a great location, lots of people to visit the stall and talk to and always a tempting selection of cake stalls to spend your money on. I’ve got new framed stock that looks fantastic, I’m really pleased. I’ve also got some new display kit to try and make the stall look a little more inviting. I’m still trying to hit on that magic X factor that makes people from across the street take notice and walk over. I’ll be showing on my own this time, as I usually share the Artsmix stalls with my good friend Richard. I’m finally moved into our new house and starting to get organised. I even went out and shot some photos the other day (still waiting to be processed). My next market is this saturday, Leeds city centre, with Artsmix, and is the final one before Christmas. In fact, the final one of any kind Richard and I have booked. Next year we’ll need to do some research on other markets to try out. Richard and I did another Artsmix market in Leeds yesterday. Richard’s new pictures of Staithes were a huge hit. It tells us something about what the buying public wants – pictures of scenes they recognise (good pictures, in Richard’s case). I found more damaged framed pictures. Framing is starting to seem like too much trouble. I’ll have to think about it more. Here are some scenes from the market. Richard – a textbook example of watching out for the background when taking pictures of people. What the public doesn’t see, the unglamourous side. The chaos behind and under the stall. 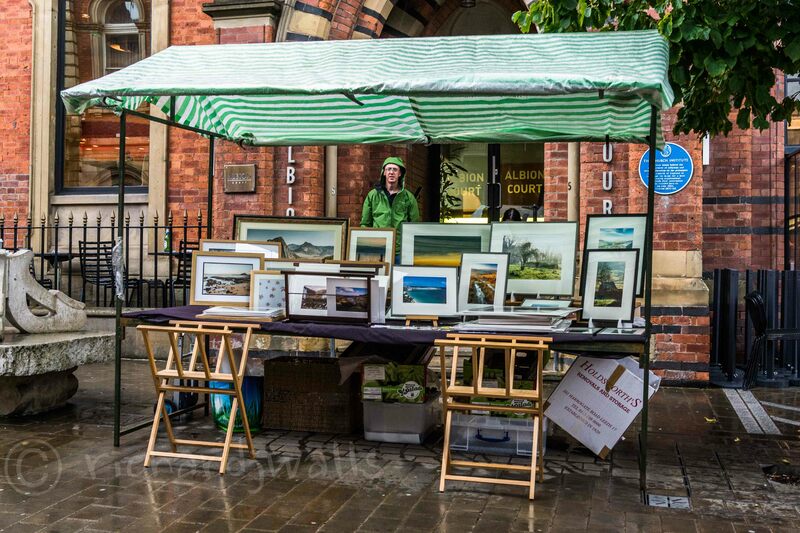 Richard (www.richardjwalls.com) and I had our second outing sharing a stall at the saturday Artsmix market in Leeds yesterday. We were both fired up to exceed last month’s vast income. Very nice weather, which is always encouraging. Even more encouraging was a lady buying one of Richard’s prints while he was still away parking his car. That was it for the morning though, some interest and nice comments but no more sales. However…that had been the case last month so I wasn’t downhearted (yet). As hoped the afternoon became busier and we sold more. We tried various sales techniques – talk to the customer, ignore the customer, reduce the prices, take the price tickets off, but sales still seem to be random events with no link between type of customer, price, subject matter, or anything. There are some pictures (for both of us) that definitely draw interest. They don’t necessarily sell but they bring customers to the stall. We’re definitely getting a feel for what customers like to look at but getting them to buy them is something else entirely. Had a good chat with this gentleman about photography but he didn’t want to buy anything. That’s part of the fun, though. Thanks to Richard for the photo. We were feeling pretty good by about 4:30, a successful day and there was a late rush of people (also expected from last month’s experience) and then it happened. The skies darkened. The rain started. The lightning flashed, the thunder clapped. We piled the stock into the middle of the stall away from the rain and mostly got away with it, just the odd spot of water. Fifteen minutes later and the sun was out. We dried everything off and laid it all out again. Still looking threatening though. In my mind I was remembering weather maps I’d seen the day before showing some very bad weather. Sure enough we started feeling a few drops. Then another stallholder started to yelp as a gust of wind caught them. I immediately put all the pictures flat on the stall – wind is (I thought) our worst enemy, it blows the pictures off their easels. I thought it was time to pack up, and started piling everything onto the stall again, but the deluge had now started. I couldn’t pack anything away without exposing it to the rain so I just had to leave it under cover and hope for the best. At first it was OK. 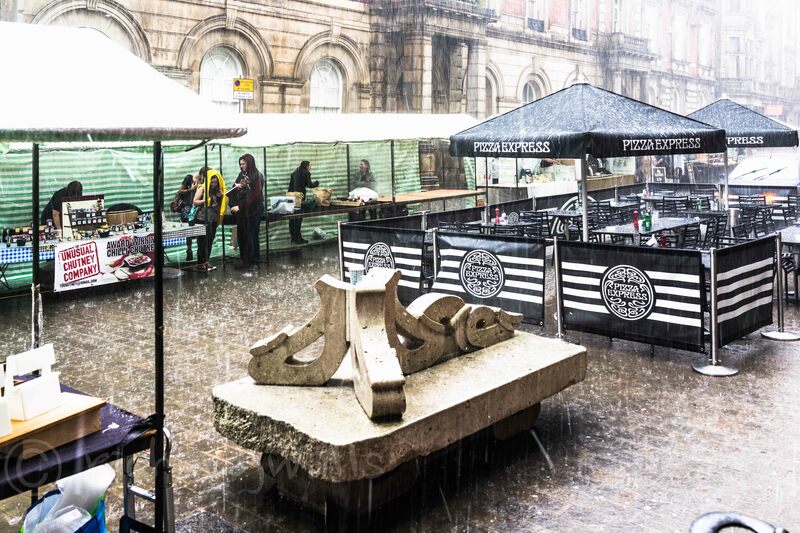 The rain was coming straight down and the stall cover was doing its job. But the rain got heavier, and heavier. Then it turned to hail. Quarter-inch diameter hail. I’ve never seen such a downpour. It was still coming straight down but it was bouncing off the street and onto the stall. I could see everything getting very wet but there was nothing to be done. Half an hour later and it was over (or at least, just turned to more normal light showers). The stock had taken a battering, I could see water damage to a number of framed prints. All we could do was pack it away and take it home. It’s now scattered all round the house, drying. I’ll take a look tomorrow and see what the damage is. 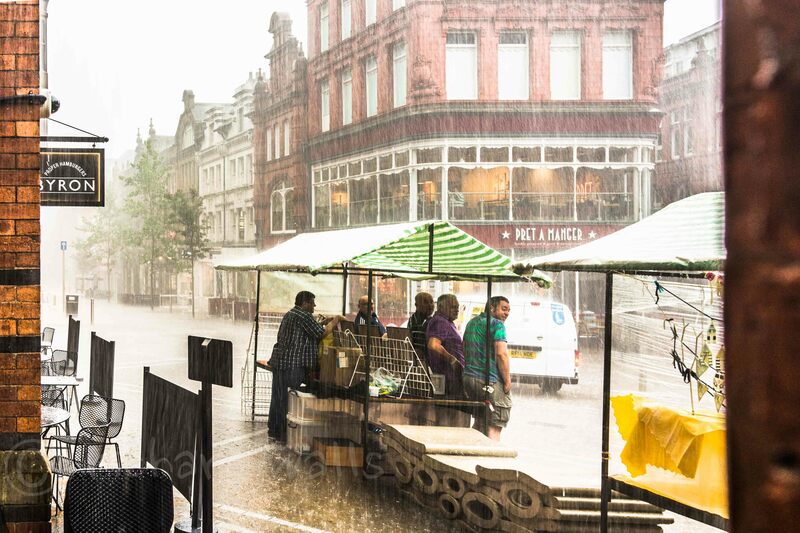 Taken by Richard from our hiding place during the deluge. There had been a slight late-afternoon rush but everyone disappeared as soon as the rain started. I’ll be showing at the Artsmix market tomorrow (the 22nd), at Albion Place in Leeds, with my good friend Richard. Since the last one, when we both exceeded our (minimal) expectations of sales, I’m now convinced that tomorrow will be the start of a new full time career as a rich and famous photographer. If you want to help Richard and I get rich, please come and see our pictures in Leeds tomorrow.